The Inn at Robert’s Grove is a luxurious resort situated near the world’s second largest Barrier Reef and the natural beauty of Belize’s Rainforest. The Hacienda-style Hotel enjoys a premier location and is nestled on 22 acres of the Placencia Peninsula in southern Belize. The Inn at Robert’s Grove is an ocean front property and has 50 luxurious guest rooms and suites, two restaurants, three swimming pools, rooftop Jacuzzis, Sea Spa and diverse complimentary activities that include a fully equipped gym, tennis court, canoes, kayaks, windsurfers, sailboats, Hobby Cats and bicycles. Their two restaurants overlook the Caribbean Ocean and specialize in fine dining and Mexican cuisine. The rooms at the Inn at Robert’s Grove feature king or twin beds, A/C and ceiling fans; and a private terrace. They are all equipped with jalousie windows, screens, hairdryer, safe, phone, cable TV, small refrigerator and decorated with handcrafted furniture in native woods, woven fabrics and rugs, Mexican terra cotta tiled floors, original artwork and antiques. 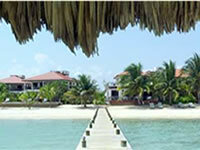 The Hotel also operates the top PADI Dive and Snorkel Center in southern Belize and the only hotel operated Sport Fishing program in Placencia.